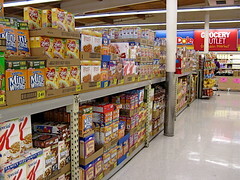 According to the U.S. Department of Agriculture, food prices are expected to rise as much as 5.5% in 2011. Those prices aren't likely to go back down. So why not invest in food futures, i.e., your own pantry? Put it this way: If you have an emergency fund in the bank, why not have food in the bank? You're locked in at the price you paid, which ideally will be the sale price (more on that later). There's always something to fix for supper, which can mean less temptation to order in. You can also pack your own lunch. If you get furloughed or laid off, you can eat from your cupboards. Getting the best deals means your food dollars go further. Having the ingredients to throw together a quick meal means less temptation to order in. A deep pantry means less need to run to the store to get just one or two items. (Can you really get out of the store with just a six-ounce can of tomato paste?) This in turn means less wear and tear on the car and less gas used. If times get tight, you can eat from your cupboard. Already on a tight budget? Don't fret. If you've got a buck, you can build a pantry. Supermarkets, drugstores, and mass merchandisers like Target and Wal-Mart want you. They want you so much they'll sell you tuna for 33 cents a can or pasta for 50 cents a pound. Get in the habit of reading the sales flyers or checking sites like Savings Lifestyle, Coupon Mom, or A Full Cup, which not only highlight sales but also match them to coupons (many of which are available on the sites). Careful use of coupons makes these sales even better. I often pay little or nothing for items like pasta, chicken broth (good for making a fast soup, or extending the homemade kind), canned tomatoes, tuna, catsup, pickles, mustard, barbecue sauce, oatmeal, cocoa mix, and vitamins and supplements. My favorite thing to get cheaply is canned fruit, for when I can't get to the store or for when fresh fruit is extremely expensive. Recently I paid 50 cents a can for low-sugar peaches, pears and fruit cocktail; I bought the maximum allowed. On a super-tight budget? Try to get at least one extra item every time you shop. Almost everyone can come up with an extra 33 cents. That extra can of tuna, combined with pasta, white sauce and a little cheese, could become a day-before-payday casserole supper. Don't ignore the dollar store, which may feature some hot food deals along with the plastic colanders and clown figurines. Your mileage may vary, since not all dollar stores are created equal. But some of them offer rice, dried fruit, jam, canned tomatoes, pasta and other items. Food blogger Billy Vasquez, aka The 99-Cent Chef, lives near a 99¢ Only store that routinely stocks frozen tilapia filets, olives, dry beans, potatoes, soy sauce, canned shiitake mushrooms, winter squash, onions, pasta and various canned goods. My dollar store isn't nearly as good as his, but I have bought kosher salt, pasta, rice, gingersnaps and canned fruit. Also Christmas gifts — but that's a different blog post. Tip: Don't forget the island of misfit foods. If you live near a Grocery Outlet or similar salvage food store, you can find great deals on groceries. 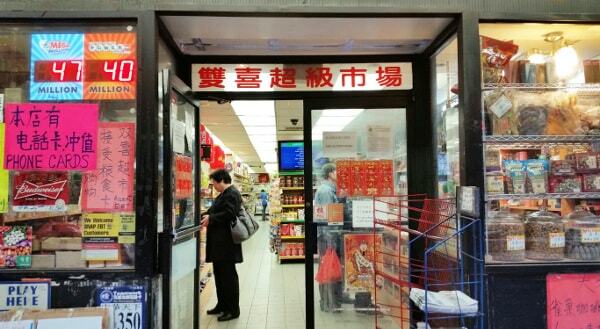 “Ethnic” markets often have great deals on produce and spices. The Asian market a couple of blocks from me has the cheapest bananas anywhere and sells chicken-leg quarters for 79 cents a pound every day. 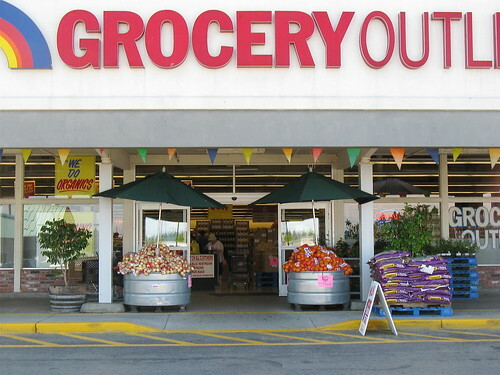 That's where I bought 10-pound bags of rice and of pinto beans for $6.99 — and a pound of pinto beans goes a l-o-n-g way. The per-pound price for such items is even lower if you shop at a warehouse store like Costco or Sam's Club. Don't have a membership? Maybe a friend does. I live near a Grocery Outlet store that offers a line of cheap staple foods plus an always-changing bunch of special items. You might see organic corn crackers one week, but never again. I saw one-quart cartons of organic butternut squash soup for 99 cents — much classier than chicken noodle and cheaper, too. Trader Joe's and other specialty shops have some surprisingly low prices. For example, I've found cannellini (white beans) cheaper at TJ's than in the supermarket. Drugstores often have coupon specials for nonperishables like soup, canned fruit (especially mandarin oranges and pineapple), spaghetti sauce, nuts, mac ‘n' cheese (yes, it's radioactive orange and yes, kids love it), peanut butter, canned fish, salt, spices and — of course — ramen. Walgreens sells a line of dried fruits (raisins, figs, cranberries, pineapple, mango) for a buck a box. Estate sales. The contents of the house must go, and that includes the contents of the kitchen. I've bought canned goods, waxed paper, aluminum foil and soap this way. In fact, at one estate sale the woman in charge just gave me the foil (a big box of it, too) and also some muffin-pan liners. The Freecycle Network. I've seen canned goods, tree fruit, surplus produce, frozen dinners and pet food offered — and you can't beat the price. Several years ago I hooked up with “Chester,” a 5.5-cubic-foot chest freezer. He's a good guy to have on your side: A little chilly, but utterly reliable — and frugal. My electric bill hasn't gone up noticeably, and having more storage space lets me take full advantage of great prices. For example, plain frozen vegetables recently went on sale for 50 cents, which means my side veggies cost 10 cents per serving. If I had a garden I'd blanch and freeze the veggies I grew; for now, I stick with gleaned blackberries and any other free produce that comes my way. I stock up on “manager's special” meats (99-cent-a-pound remaindered bacon, anybody? ), loss-leader poultry (such as the “desecrated turkey” that cost me 25 cents a pound), cheap bread from the bakery outlet and on-sale butter to go with it. Some people freeze milk and cheese. I've heard of rice being frozen, either raw or cooked. Related reading: Check out these past GRS articles on how to cut your food costs with a stand-alone freezer and how to buy a side of beef. Obviously you'll need to rotate the stock. Put new items in the back of your pantry or cupboards. To be on the safe side, write the date of purchase on the front of the item with a black marker (not a pale-blue pen). These are not bomb-shelter rations, incidentally. You'll be eating from the pantry all along. Once you get in the habit of watching for good sales you'll continually replenish your stores. Here's a checklist to help you with building your own food bank, i.e., a pantry full of staples you bought at rock-bottom prices. This is not emergency food, mind you, to be saved for the next hurricane or other disaster. The point is to eat from this pantry all along, replenishing when prices are best. What if times are already tight? That's OK. You can get going on as little as a dollar. 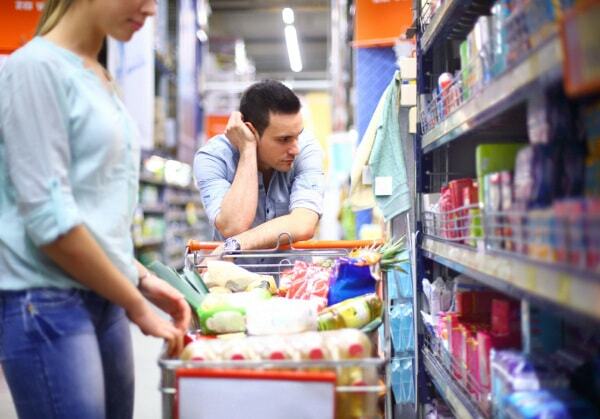 Try to get at least one extra item every time you shop. Look for shelf-stable foods like dried fruit, ramen, pasta, peanut butter, tea, coffee and canned beans, vegetables, meat, fish, soup or fruit. Your favorite soup, three for a dollar; pasta for 79 cents a pound; two cans of tuna for a buck — stores offer prices that low to get you in the door because they assume you'll do all of your shopping there. Be the exception: Take advantage of the best prices and then skedaddle. Note: Driving 10 miles out of your way to save a quarter obviously doesn't make sense. Pick your spots. Regional coupon bloggers and national sites like CouponMom.com and AFullCup.com match sales to coupons, many of which you can print out or download to a store loyalty card. 4. Hit the dollar store. Concerned about recalls of foods produced in China and elsewhere? Buy only U.S.-produced foods. I used to get my Arkansas-grown rice at a Seattle dollar store along with things like pasta, gingersnaps and kosher salt. Food bloggers talk of finding olives, marinated vegetables, frozen tilapia filets and other everyday gourmet foods; if you're lucky enough to live near a 99¢ Only store, you can get fresh produce too. Ask around for unused produce, fruit or nuts; some gardeners are happy to share. I've also seen this stuff on The Freecycle Network. Or check the following websites: Village Harvest (nine U.S. states and one Canadian province), Urban Edibles (Portland, Ore.), Fallen Fruit (Los Angeles and environs) and Not Far From the Tree (Toronto). Don't glean from vacant land or woods unless you have permission from the owner, and note that in some areas it is not legal to glean from city, county, state or federal lands. 6. Check out ethnic markets. I lived near an Asian market in Seattle where I bought 10-pound bags of pinto beans for $6.99 and the cheapest bananas and chicken in town. Peek into your own local Hispanic, Asian or other specialty stores to see if the prices there are as good or better than the supermarket's. 7. Join a warehouse club. Although sales-plus-coupons at drugstores or supermarkets can be super cheap, Costco or Sam's can often beat grocers' everyday prices. Buying a six-pack of canned tuna means you can use some now and hold on to the rest. Certainly their prices on dried beans and rice are primo. Just don't buy a giant jar of salsa or peanut butter if it's going to go bad before you can use it all. Don't want to join? See if a friend who's a member will pick up a few items for you. Those coupon bloggers also highlight weekly specials on foods like soup, canned fruit, spaghetti sauce, ramen, cereal and teabags. Stack these specials with manufacturer's coupons and you can get some very inexpensive items. These items may not make up a completely healthy diet, but they're nice fill-ins or quick meals when you need them. 9. Buy like a restaurateur. Do an online search for “restaurant supply stores” in your area and hone in on the ones that (a) are open to the public and (b) sell comestibles as well as cookware. A store near me in Seattle, Cash and Carry, let home cooks come in for warehouse-club-sized portions without paying a warehouse fee. Not everything was in a No. 10 can, mind you; I could get meat, cheese and produce (all of which freeze well) in reasonable quantities at startlingly low prices. My partner and I routinely buy good-quality sandwich rolls and multi-grain breads for as little as a dollar per loaf, and tortillas for 50 cents per bag. It's not stale. It's surplus, and it freezes well. 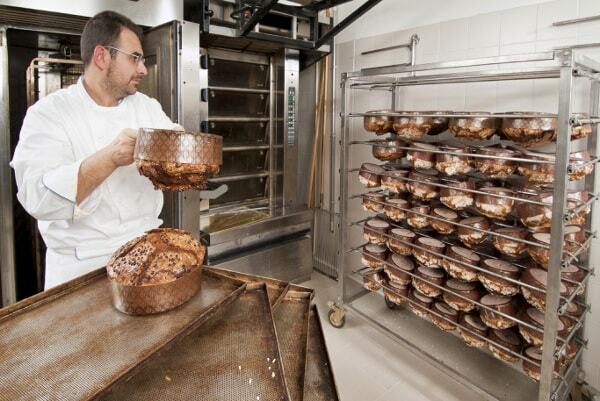 Do an online search for “bakery outlets” in your region. The quinoa that sells for $10.29 a bag in Anchorage markets was free to me because I bought it using Amazon gift cards obtained from the Swagbucks rewards program. MyPoints also offers Amazon cards, as do some rewards credit card plans. You could buy everyday foods that way too. Depending on where you live, getting food straight from the farmer can be a real deal. The results can be frozen, dried or canned. Find a farm at PickYourOwn.org or PickYourOwnFood.com. Yes, really. I've seen frozen dinners, tree fruit, canned goods, surplus produce and even pet items offered up for free. As a single woman in Seattle, I owned a 5.5-cubic foot chest freezer, for great deals on loss-leader frozen vegetables, breads, dairy products, and meat and poultry. It was rather surprising how such a small appliance could hold such a lot of food. If you're into batch-cooking, spend part of a weekend day in the kitchen and you'll be able to freeze a month's worth of meals. 15. Tally and date your finds. Each time you buy something, add it to a master list. This is especially important for the freezer, because things way down at the bottom get lost and may wind up freezer-burned. For other items, use a black marker to write the date of purchase on the fronts (not the tops) of packages or cans. Rotate the stock so you're using items regularly. And again, buy stuff you actually like because stuff that doesn't get eaten is no bargain. 16. Think outside the cupboard. Stack goods in an armoire or in a dresser, trunk, bookcase or even a file cabinet. Add shoe organizers inside closet doors and store small canned goods, spices, toiletries and the like. Stock up using under-bed boxes (shades of the college dorm!) or stack plastic totes full of food and cover with a decorative cloth: instant end table! Put up shelves in a closet, laundry room or basement to store and organize your canned food and dry goods. Of course, the most important tip is to bank your savings! Remember: The point is to stock up on stuff you'll actually eat. It's not a bargain if it just sits on the pantry shelf. How do you build up your food pantry? Share your tips in the comments! Grocery Outlet photos are by Karawynn Long, and come from her GRS post on saving money at the island of misfit foods. There are 131 reader responses to "Fight Rising Prices by Building Your Own Food Bank Pantry". Thank you for these great ideas! My wife and I will be moving soon, but once we are settled, we’ll have to stock the pantry with some great deals! Second fridges/freezers are great but keep in mind that it costs money to buy and operate (in many cases more than $20/month in electricity). The other issue is that when you have so much food storage space…things get lost/forgotten. If that $0.99/lb steak sits at the bottom of the freezer for 15 years, is it really worth it? We recently had an Aldi supermarket open in our area. It’s reliably less expensive than Target, Walmart or CVS (and much less expensive than a regular grocery store). Their produce is awful, but everything else is great — 39 cents for a dozen eggs, $2.50 for a gallon of whole milk, 99 cents for sour cream with no whey or funky stabilizers. Here (in New England) we have a lot of mom and pop fruit and veg stores (mostly run by Greeks) where they sell perfectly good produce that isn’t fancy enough for the chain grocery stores at deep discount prices. I don’t always like running around to a million different stores to save 30 cents (not much of a savings with time and gas factored in), but using Aldi plus the fruit and veg place makes shopping easy and cheap. “Estate Sale?” Really????? I can’t see myself combing the legals and obituaries pondering who had the best selection of Hot Pockets in their freezer so I could pillage through some random dead persons kitchen. Here in the midwest we have estate auctions. Everything that is sellable is put out on tables and trailers. Then an auctioneer auctions the items in groups or lots to the highest bidder. I have bought food this way. In fact there are many grocery auctions near us too. The discount grocery stores will get in a big shipment of dented cans and will auction them off too. Sometimes you can get really cheap deals. I stocked up on butter once only to find that we don’t go through it fast enough. All four pounds of butter tasted like the freezer, but I think that it might have been already tainted when purchased. Sometimes you can be duped into buying groceries at deeply discounted prices because the products have been shelved for too long at the store and need to go. 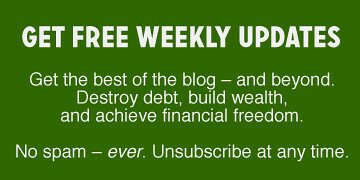 This article is a great reminder of one of the easier things I can do to streach my dollars. We also order a side of beef from the local cattle farmer every six months and split it with friends of ours. We live in a little town on the Eastern Shore of Maryland and we have a great local grocer that will actually order you cases of food at a discount (10-40%). This is nice because I get the things we eat most often at a discount and I don’t have to clip coupons or chase sales (neither of which I am good at doing:). This works for me because I only have to shop once every few months for the big items and can suppliment with our garden veggies and stop to pick up milk and cheese during the week. The down side is I do have to spend the afteroon after my shopping trip to freezer wrap the case of chx breast and put everyhing away. Also, we do freeze milk. It works fine and we are using skim milk. I am not sure how it would turn out if you froze milk with a higher fat content – would it separate? It’s a little late now, but a good time to go shopping to fill up the pantry with staples is during major food holidays: Thanksgiving, Christmas, 4th of July, Superbowl. Stores often have enormous prices on basics during those time. Don’t fill your pantry with food you don’t eat, unless you want to be donating a bunch of stuff to the next real food pantry collection. Having a stocked pantry is also great when the weather is bad. Everyday Tips has a post on that today. The auxiliary chest freezer is key if you can in any way afford it. You can eat out of a decent chest freezer for MONTHS. One freezer strategy that can really cut down on meat costs AND ensure a better, healthier brand of meat is to split a whole cow (or pig, even) with a buddy at a local butcher. By purchasing half a cow at one time, you’re knocking out probably six months worth of beef and the per pound price is usually far below the supermarket for a much higher quality product. Just as a matter of course, we keep our rice in the freezer. Not sure it extends the life of it (though it probably does), but the dry environment of the freezer also keeps it fresh. @Chett Daniel: I’m with you on that one. The others are great ideas! Plus, depending on where you live, you could get snowed in and all of the food stores could be closed for days. One of our local grocery stores is currently going out of business and everything in the store (with a few exceptions, like meat & diary) was 50% off! So, we stocked up pretty good … on top of our normally well-stocked pantry. I know that it is not standard but it is important to keep and eye for closing stores. In the last year, one Rite-Aid and now a Shoppers Food Warehouse has closed in our immediate area. @David Hunter: A whole bunch of Texans are finding this out the hard way! We’re totally prepared for hurricanes. Snow storms? Not so much! As an apartment dweller, I don’t have much room to stock up so I have to be very careful about what I buy and how quickly I’ll use it up. We frequently buy large cuts meat on sale and butcher it ourselves – and we’ve found a vacuum sealer to be a good investment. Last fall, I bought both a beef rib loin ($3.99/lb) which yielded a small standing rib roast and ten ribeye steaks (plus ribs for the barbecue this summer), and a boneless strip loin ($2.99/lb) and ended up with a roast, several NY strip steaks (8 or 10) and a couple of pounds of beef to grind for burgers. Altogether, I spent just over $100. The meat was all vacuum sealed, so it’ll keep well in the freezer through the summer (grilling season). We moved into a tiny country house in a semi rural area, and built into the hillside behind the house is a large concrete food/root cellar – the depression era folks who sold me this home kept it well stocked with their own preserves and canned goods, and proudly showed me photos. I do purchase lots of food in bulk and keep that cellar stocked well. Dried goods, pastas, beans, oats, wheat, plenty of canned goods. The more perishable goods are sealed in food safe bags and buckets. It’s not just good economical sense, but good to have in case of an emergency where supplies cannot get through. The gigantic storm sweeping the Midwest is a good example of an event that can disrupt the food supply and shipments. Definitely rotate the stock, and freeze rice and flour/grains for 48 hours prior to storing in food safe bags/buckets. That’ll kill off weevils and bugs. If milk or juice will be going bad before we can consume it all, I freeze some in mason jars for later use. I make lots of soups, stews, and casseroles to freeze in 2 meal portions so that we always have options if we’re too tired or busy to cook. Stocking the pantry and freezer are excellent ways to save $$! I lost everything in the freezer to a storm in the summer. Now I go the direction of canned goods. Swanson’s white chicken is excellent. Don’t forget to rotate foods- putting the newer expiration dates in the back. Bury potatoes and onions in sand outside your back door- they can last a LONG time. Finally, trying to beat inflation with a pantry is a bit crazy. You will still eat and the prices will still rise. Stocking for survival or storms or one less tank of gas—those are all reasons. Inflation? have a good producing garden and some chickens! I couldn’t agree with you more. Having your own supply of food bought at rock bottom prices is the best way to save money. And when you are in a pinch and have an emergency that will take all available funds – you don’t have to worry about what you are going to eat, because you have a pantry full of food. We just ate from ours for a month in order to pay for the dog’s surgery. worked great! @Jan — good point! I don’t think there’s a whole lot we can do to stay ahead of rising food costs. I wonder if most people would be better off with smarter shopping lists and better meal planning so they don’t throw out food. The amount of food the average North American throws in the garbage is quite shocking. Besides, I often find when I stock up on things, I feel I have to use them up faster and I’m not as careful. (“I have lots of this, I’d better use it…”) Increasing consumption, even if the goods are cheaper, doesn’t save money. You may also want to buy in bulk. In Canada we have Costco and you get a lot of staples / pantry items at these bulk stores and you end up paying rock bottom prices per unit. As mentioned in the story, we do freeze cooked rice (brown rice). I always cook 2 cups whether we’re going to use it or not. Then freeze leftovers. When you’re in a pinch for dinner, take it out, put it in a colander and run hot water over it for a minute or so. Just like freshly cooked rice everytime. BTW, I live in an area where none of the grocery stores double coupons anymore, so it’s especially important to stock up during sales and pay attention to sale cycles. When I notice my pantry or freezer getting too full of one item, I cook a large batch of something using those items and then freeze leftovers. That way, I have turkey tetrazzini in the freezer, not just 3 pounds of turkey cutlets that I bought on sale. This post comes to me at a poor time (from a personal level), as we are currently blogging about our experience of “eating only food that is already in our house for a month.” Looks like we should have kept the stockpile of edible foods she constantly overlook and refuse to eat. Oh well, lets just hope the apocalypse doesn’t begin during the next month or so. Awesome and uncanny timing on this article – we were just talking about restocking our pantry without breaking the bank last night! thanks!! I’ve always turned my nose up at shopping at WalMart and the dollar stores, but maybe I need to take a second look to see what they actually stock other than the junk food in the first row. These aren’t bad tips, but sometimes it’s a little frustrating to see the assumptions a pro can make. One bedroom apartments don’t always have room for a full-sized normal fridge/freezer unit, much less a full standalone freezer. Our pantry and cabinets are as full as we can make them already, and our freezer can’t take anything beyond the normal week-to-week meat and frozen vegetables. I would love your root cellar! I have about a 1/4 acre property (which includes a house, shed and some unusable land) and I plant every inch that is workable. Last year I threw a bunch of potatoes and onion seeds in the ground and we are still enjoying them! The root cellar is a fantastic free idea (compared to buying a freezer and paying extra electricity… is it really a deal??) and the cellar keeps good quality fresh foods that are so much more healthy than frozen dinners and microwaveable items. I have over 100 pounds of tomatoes that fed half my neighborhood, if only I had a place to can all that! I agree with Chett. Buying canned goods from estate sales is one tiny step above dumpster diving. Good article, but those of us in smaller houses will have a harder time implementing. Best way to save money on food is to eat less. Most of us would be healthier if we did that. I think that if you want to you can eat really inexpensively. For instance, for breakfast a giant container of oatmeal is like $3.00 and it would give you a healthy breakfast for a few weeks. Then, for lunch you find a 10 for 10 deal on soup or something and bam, you have a (slightly less healthy but they have reduced sodium soups) decent lunch for $1.00 per day. Then for dinner, as sides you find 10 for $10.00 deals on frozen vegetables and some decent but inexpensive meat/main course and there you go. It is all the snacks, soda, and other crap you don’t really need that really hurt your food bill, in my opinion. (I admit the hard part is practicing what I preach in this area). My problem with always thinking about food in this light is it gives people the notion that all food is created equal. Which is just not the case. The $2/pound pasta is probably $2 because it uses real ingredients and is better for you and probably tastes better to boot. Most of the loss leaders that supermarkets offer are loaded with bad stuff that most people would be better off just avoiding entirely. Sure. Sometimes you find deals, but at the end of the day one of the most important things you can do is put good food into your body. Put quality over quantity here people. Great post Donna. Very few people can make buying canned goods interesting. Does anyone have ideas for saving on “luxury” items like almonds? My husband loves nuts as snacks and I like to encourage his healthy choices but they can really blow a grocery budget. Since we aren’t broke, I try to balance these kinds of great cost saving ideas with some higher cost items. If you have to get your groceries this cheaply, do so but note that it means your chickens are being raised in tiny coops, that your veggies are being grown with lots of pesticides, and that the people providing the labor may not be receiving a living wage. There are always trade-offs. We are doing this so we can feed our large family. We bought boneless skinless chicken for 98 cents a pound. We have about 70 lbs left still. We are gluten and dairy free so we have tons of almond milk bought on sale (much longer shelf life than cow milk), gluten free dairy free waffles-bought on BOGO for 1.50 a box-bought 65 boxes for $60 with coupons and now will not buy probably for 1 year. My only problem is, we are running out of space but I have to keep finding more because being gluten and dairy free, our costs are very high all the time but we are making it work and I am at peace because of our full pantry and freezer! C) My fridge freezer was filled to capacity so making anything new to separate into meals and freeze was impossible. I believe deeply in having food on hand in order to make a meal at anytime and I think the more I have stocked, the easier it is to do that. I also believe deeply in saving a buck. :) However, I also think it’s good to run through items in a “pantry-challenge” sort of way, especially if you are like me, so that stocking up does not equal food hoarding. As to the quality– I can still do quite a bit of “organic” (something I do care about) if I pay attention and use my freezer well. I think it is possible to eat healthy and cheaply– but it takes work and time. Funny to read this today as yesterday we sold out chest freezer for $50 to someone who might use it. I use to stock up on canned items and items to freeze but realized we really did not touch most of it. For the last two months we ate everything from our chest freezer and our pantry. We sold our freezer and now just have a few things in the pantry (rice, pasta, oatmeal). Instead of stocking up I place the little extra $ in our savings. As we live in Florida we do have an emergency supply of food and water. Stocking up just doesn’t pay off for us. Great advice though. I tend to keep a stocked pantry since I learned that from my mom. I use a website called The Grocery Game to figure out when the best time to buy things is (with coupons and sales). It’s a subscription site, but I save about 40% on all my grocery shopping, so it pays for itself. One hard lesson I learned is that I should not buy more than I think I’ll eat before it expires – I cleaned out my pantry last Fall and had to throw out 4 bags of groceries. Just because it’s a good deal doesn’t mean you’ll use it! Or, go through your pantries once every few months and donate food that is about to expire that you don’t think you’ll get to. @Erica mentioned Aldi – we have several near where I live – and they are wonderful for staple foods. Not so much for produce, and meat is touch and go. But I can buy just about all my shelf-stable staples there for half the cost of grocery store prices, and they’re good quality too. Also, they have a line of imported chocolates (Choceur) that are amazing. I know my wife’s one uncle (who obviously has an extra freezer and way more space than we do in our little apartment) will have like, whole animals slaughtered for him at some ridiculous wholesale price, but over the long run he will end up saving a ton of money while supporting local farmers. Kind of cool in a way. This is definitely a great idea, but I don’t think that I am actually ready to implement something like this quite yet. If you’re not above producing some of your own food, rabbits are a very good source of meat in an urban/suburban setting that is often overlooked. 2 does and a buck will provide meat for a small family, and it is very lean meat at that. No matter what method you use (freezer, pantry, etc), just stock up. It will come in handy during bad weather, financial difficulties, sick kids, you name it. It doesn’t have to be done all at once. If you realize you’ve got a couple dollars left over after your grocery shopping is finished, then find something on sale that your family likes and buy one extra. Little by little it will build and you won’t regret it. Good article, but is it really “homemade” sauce if you’re using canned tomatoes and tomato paste? We’re looking in to buying a side of beef or possibly splitting it, which will necessitate us buying a small chest freezer. as we routinely lose our electricity here, I don’t stock up the freezer too much. BUT I do buy on sale always, only good food and no, to the poster who said most inexpensive food is probably not good food. Read labels and you’ll see that a lot of times you’re just paying for a brand name or fancy packaging. If you’re talking convenience foods loaded with sugar, salt, fat and preservatives, then I’m with ya. Small house too, but I do keep multiples of things I use regularly as when they go on sale I buy a few so I always can make something! The article contains good advice that can be scaled to your circumstances. You’re spot on with the estate sale bargains. A friend of mine came away with so much stuff I couldn’t believe it. Most of the food was free, just given to her. The daughter just wanted it gone and was so grateful to be able to give it to someone who needed it. Not many people think about that. @ #2 Aaron: The small freezer I bought has had little to no impact on the electric bill. In part that’s because I rarely open it; when I do, I take out a LOT of stuff (e.g., two chickens, four bags of blackberries, two pounds of butter, three packages of bacon) and put those items in the freezer atop my fridge. Weeks go by and it never gets opened again. I can still hear my mom hollering, “Close that freezer!” when we kids would linger in front of it. She was right. Believe me, nothing ever gets forgotten. I make it my business to use up everything. If you were afraid of losing food, you could always keep a tally of what’s in there and cross it off as it gets used. Chester cost about $180 three years ago. That’s $5 a month plus a negligible amount of electricity. In return I’ve been able to store tremendous amounts of tremendous deals. Definitely worth it. I feel the same way about yard sales. Neither venue consumes my life, but I’ve found some very useful items that way. Relax, buddy. No one is making you do this. It’s all voluntary. @ #13 Elizabeth: I live in a one-bedroom apartment myself. I’ve learned to get very creative about storage (under the bed, behind the bookcase). And, in fact, the freezer is in my bedroom — there’s nowhere else to put it, since the “kitchen” is really just a little galley area. Do what works for you — but take a look at unused space and see if you could, say, put up a small yard-sale armoire or chest (the yard-sale kind, of course) and stash extras there. I usually do just-in-time kitchen restocking, but this year I’m going to try to do better with a pantry. Even in a high-cost neighborhood with no gardening available (apartment, middle of Los Angeles), I’ve been able to score some real deals just by knowing which supermarkets do certain things best. I got a 1.6 pound tri-tip roast last night for $4.84 – that’s three to four meals, and only 20 minutes under the broiler. Ten days ago I got a NINE-pound package of pork shoulder for $13. @ #23 Sam Russell: I live in a one-bedroom apartment myself and I’ve got both a freezer and quite a bit of food stashed. Do the best you can with what you have. But take a look around and see if any unused space could be reconfigured. I’ve done a two month and three month pantry challenge and survived just fine without grocery shopping (Details on my blog). To know what you have, especially in the freezer, I suggest lugging it all out and creating an inventory of each item. You can create lists like meat, dairy, fruit, vegetables, etc.noting the quantity of each. I keep it taped to my freezer. Whenever I pull out an item, I put a chicken scratch next to the item on the list. It also helps to know what I need to buy. I also inventory what I can, dry, and freeze in the summer. No need to put away more than what I will use in a year. As for yard sales, I scored 18 canning jars, a big box of spices and other dry goods for $3. It might not happen often, but it’s a great windfall when it does land. Dried beans are a lot cheaper than canned, but take two hours to cook if you do it the traditional way. I cheat! I boil them for two minutes, drain them and put them in a plastic zip lock bag with a little water, then freeze them. When you are ready for dinner, they’ll cook up in about twenty minutes instead of two hours, and you can use as many or as little as you want. Also, if you grind them up , you can put them in all sorts of things to stretch your meal dollars and protein quota big time. I definitely support the idea of shopping smartly, and stocking up when prices are low. I agree though that it can be hard when you live an apartment, especially with a roommate – my freezer and pantry space is cut in half! I’m currently doing a self-imposed ‘Pantry/Freezer Challenge’ to reduce my ‘food bank’ contents, as a way to be more mindful of what I have and how to use it (rather than just buying another can of tomatoes at the store, oblivious to the fact I already have 4 at home, etc) – and documenting on my blog. @ #25 Money Smarts Blog: It’s easy enough to check the sell-by date on a can of tomatoes at an estate sale. Other items, such as the aluminum foil, don’t ever go bad. What’s the problem, then? Obviously you shouldn’t do anything you’re not comfortable doing. But to say that an estate sale is comparable to Dumpster diving is just wrongheaded. Take the ideas that work for you and leave the rest. And to the folks who keep saying “But I live in a small house/apartment” — I live in a one-bedroom apartment with one medium-sized closet and one coat closet, and I have both a freezer and a lot of food stored. Get creative, e.g., under-the-bed boxes. Or don’t. Nobody’s forcing you to do any of this. But when you wind up paying $1.29 for a can of tomatoes that were on sale for 50 cents the week before, it’s frustrating to know that you might have been able to stash some extras. I want to echo Nick (#27) and emphasize that, especially for meat, you’re paying for what you get. Those 79 cents a pound chicken legs are from chickens raised in horrible conditions (tiny cages with so many other chickens around they have to trim their beaks so they don’t hurt each other), fed the cheapest possible feed, and stuffed with antibiotics – is that really what you want to put in your and your kids’ bodies? I’d vote to eat chicken half as often and spring for better quality when you do. @ #32 Sara Trice: I’ve heard people talk about The Grocery Game. Just FYI: You can find sales highlighted and matched with coupons for *free* at CouponMom.com, and maybe at others, too. Any chance you could provide another source of finding these types of stores? Thanks! J.D.’s note: When I was editing this post yesterday, I noticed that the gnivas.com link on the old post was dead. That bummed me out. I spent some time looking for something similar, but didn’t come up with anything. I’d love to see a new “Discount Grocery Finder”, too. This is really great advice, what a good article! Thank you! Free food is definitely available if you look hard enough and hit the sales with coupons. Also there is a tasty supply of homeless people available in ever growing numbers. Slow roasted with some chipotle sauce, yummy. Of course, you might find yourself on the menu at some point. @Chris #28 — the best place I’ve found to buy bulk almonds is Oh Nuts! (http://www.ohnuts.com/buy.cfm/bulk-nuts-seeds). If you sign up for their newsletter, they will often have sales or discounts available around various holidays that make the prices even better. We would get 25# at a time to reduce the price, use the discount, and then rebag and freeze the nuts when they came so we had out only a lb or two at a time for snacking, cooking, etc. In NYC there is a whole subculture of people called freepers, who are, in actuality, dumpster diving for food. Look it up; there is a whole methodology for doing it safely correctly, and politely. There are businesses, who knowing the freepers visit, package their items in the trash carefully, so they may easily access viable food. Of course, there are those that deliberately destroy viable food, because they think that someone eating it out of the trash somehow loses them money and god forbid they share something they cannot sell. And for those who judge, may you not EVER be in a position whereby others may unfairly judge you based on your survival choices…or you may just reap what you are now sowing. Never say never. While I may have yet to dive for food, there’s been many a time that elbow grease on a dumpster chair, turned into a nice little bit for either the emergency, or the emergency fund. And if I ever need to be THAT economical as to dive for food, I know how to do it and will not hesitate–while you starve slowly and silently with your pride. Why turn it into a moral question? What’s the difference between working hard for your food by harvesting a second gleaning vs. taking a food stamp voucher from the government? The difference is you don’t have to watch the food stamper working at survival. It screws up that image of the advanced american society. Same people who don’t like dumpster divers also kick a fuss when they get in line behind a coupon lady. This thread just applauded a coupon lady a few weeks ago so don’t turn hypocrite now. Something about the premise works; City Harvest feeds millions on it. Living alone, I’m more likely to waste money than save money by stockpiling. I do my own form of this by buying staples at cheaper grocery stores when I come across them and have my car. I live downtown Toronto, all the within walking distance grocery stores are priced outrageously high relative to the stores in the burbs–to compensate for the higher property values I guess? The nearest No Frills type grocery store is far away by foot and in a very bad neighborhood to boot. I think if I did something like this I would need a very large lock on my food storage otherwise I’d start picking out of it rather than going to the grocery store. Also? Simply consume less meat. Though we’re not vegetarians per se, we incorporate non-GMO soy a few times a week, and I get most of my daily protein from a morning smoothie with protein powder. The kids absolutely love grilled marinated tofu. No kidding! Sure, pulled pork is a dream on a bun. But it’s a treat, not a staple. Overall when we minimize our meat consumption we save a couple hundred a month. I’d rather splurge on some beautiful beans than spend three times as much for low quality beef any day. I noticed yesterday that rice on the commodities market closed two cents from “limit up” after closing limit up the day before. I know storage availability varies by housing situation, but for me and my family, it makes sense to stock up in bulk on times like flour and rice. We can store them economically, and they keep for a while. Sure, we’re prob only nailing down a few dollars in savings, but we’re not buying loads of small food packages often, thus saving trips to the store and on gas. The neighbors think we’re nuts, having a 50lb sack of rice around (in the closet), but it works for us. If you are in the South Southern Savers is a good website for matching stuff. Also Couponing 101 is a good blog that does a lot of coupon matching for free. There’s not an Aldi’s near me but we do have a Big Lots – but it’s on the othe rside of town and I usually foget to check there. Although in the past I’ve found Muir Glen tomatoes for $.50/can. All with a year left on the expiration date. I would love to buy more free range meat, but unfortunately it’s usually priced out of my budget. Everyone should make sure they know the coupon policy at their favorite grocery store. Mine takes “competitors” coupons and includes Walgreens and CVS (as well as Target and others). They also allow you to combine store, competitor, and manufacturer coupons on one product. Also you can use $1 off 2 type coupons on buy1Get1. Like soup is on sale 1bg1 and I have coupons for $1 off 2, that’s really a dollar off one item and with multiples that can really add up. (Online coupons you can usally print out twice or three times and I usually buy 2 or 3 Sunday papers for coupons). @Shash #30 – we make an effort every year starting January 1 to really eat down the stockpile. I like to have the freezer empty by the end of February (so we can unplug it from February to about July) and go through all the home-canned goods just as the new fresh stuff comes in. This year we’re taking aim at the purchased pantry stuff too – noodles, beans, etc. I made soybean soup last week! We don’t go 100% pantry, but we do our meal planning around the pantry during this time of year when we’re not adding food from the garden and farmer’s market, and then in May when the market starts up again we have a lot of space. 1. Homemade tomato sauce! I melt two tablespoons of butter in a pan. I briefly brown 1/2 a grated onion and 1/4 tsp of salt. Then I briefly (30 seconds) cook 2 cloves of garlic and 1/4 tsp of dried oregano. I pour in a 28 oz can of crushed tomatoes and 1/8-1/4 tsp of sugar (depends on the brand of tomatoes I use) and simmer for 8 minutes until thickened slightly. Right before serving, I add 1-2 tbsp of olive oil and season with salt and pepper. It yields 4 servings and costs less than 1/2 of the cost of jar sauce. 2. Dried herbs, unless I’ve grown them. I can never use fresh herbs fast enough to justify the expense. 3. Consuming only the serving size of expensive items like nuts. I pack small bags so I’m not tempted to eat more. What is everyone’s opinion on warehouses like Costco and Sam’s Club? I’m in the rewards program and share a membership with my MIL. Therefore, this year we paid under $25 for our membership. I don’t buy everything there, especially when I can find a store brand item at the regular grocery store it’s often cheaper than name brand bulk. I know I save more than $25 a year on groceries though. …Though, I did notice that they had a lot more higher end stuff (organic, etc.) going into the recession than the seem to have now. I suspect that’s because people are starting to shop the highend stores like WholePaycheck… err.. Whole Foods again and thus they don’t have inventory that they need to get rid of at a GO. Because my husband’s (main bread winner)work is so slow during the winter season I stock up on all grocery & personal items throughout the spring, summer and fall seasons. Then I only buy what we absolutely need, fesh milk, veggies & fruit during the winter. I have been doing this for about 25 years and have never thrown out food because it has gone bad because it got lost in the pantry/freezer. Yes, some organization is required, but well worth it. This is what works for us, everyone has different needs/situations. We also plant a garden, have several fruit trees & berries and I can/freeze what we do not eat fresh as they produce. We purchase a 1/4 side of beef every spring. When I lost my job for over 2 years we cut back on the stocking up a bit, but not completely. As a child I watched my parents and grandparents stock food for the winter when often times they were snowed in for days. It just seems like a natural thing for me. We used to run a chest freezer (fairly energy efficient and new) but at one point it was getting empty so we decided to turn it off for 3month electrical billing period to see how much power it used. Result it was consuming somewhere in the realm of $250 of power a year. I don’t know what the power prices are like in the US so you might be getting a better deal on cents per KW than we do downunder. The conclusion we no longer run it except for stock ups towards Xmas if family is visiting etc as when we divided the power cost across the savings we were able to make on the food items in the freezer it turned out we weren’t saving any money. It didn’t help that we had seriously cut down our meat intake around the same time. Saying that when we were buying half a cow (about 12months of meat) for about $2 a kg for all cuts and storing it in the freezer we were saving significantly. Storing high price items bought very cheap in the freezer was great value, storing lower margin on sale frozen veg etc (50c-$1 savings)just wasn’t worth the freezer running cost. Cupboard storing big on that as the cupboard costs nothing to run and is there whether full or empty. @Rachel – you should check out a food co op or organic store to see if they sell herbs and spices in bulk. It’s a great way to get them cheap. The last time I stocked up I bought 5 or 6 different herbs and spices for about $3. I refill the glass jars, and I’m always buying more than will fit in the jar (I just keep it in the little bag). [email protected] – Check your farmers’ market. Occasionally, I’ll find some at my local farmers’ market, and they’re much cheaper there than anywhere else. Also, Trader Joe’s often has good prices on nuts. Almonds answer for Chris: You can get a big bag of raw almonds at Costco for a reasonable price (can’t remember the price offhand, though). I freeze and then roast about one-third of the bag at a time. If you are stocking up on rice, flour, pasta etc. beware of flour moths. I’ve been infested and had to throw out a fair amount of food. I now put all of these kinds of foods in glass jars, moth proof containers, or store them in the freezer until I need them. I’d also recommend you check out Liz Pullman Weston’s link in Donna’s article as it has quite a bit of information about shelf life etc. of various staples. My father has been doing this for years. He has a stock pile of non-perishables in the basement that make it look like he’s prepping for the apocalypse. My husband and I don’t have the storage space for this type of stock piling. However, we did recently invest in rubber “futures.” We hear that the price of rubber will increase this year, so we bought our next two sets of tires (all seasons and snows) even though we won’t need them until April and November, respectively. Got both sets for $650 incl shipping. I REALLY like the way you’ve scheduled it… very smart. I admit, I’m not extremely strict in my pantry purging. In fact, I’m holding back on my last 3 summer tomato sauce containers– trying to space it out over these (hopefully) last weeks of winter! One good thing about being married to a type-1 diabetic is that nutrition is always on the top of my mind. Even when we were working our way through graduate school, I always bought very high quality meat and vegetables, because to do otherwise was to risk his health in a major way. Diabetes care has improved a great deal since then, but we have stayed the same. Anyhow, why buy cheap cuts of meat and then watch all the fat run off it? What we NEVER bought, and still don’t, is sweets and chips. They are budget and body killers. Our children, who are at greater risk that the rest of the population of developing type-1 diabetes, snacked on carrots, graham crackers, and cheese. Once in a while we bought animal crackers and pretzels. I always had a well-stocked pantry and freezer. Since we get paid once a month, the first shopping trip was always to the grocery store! And we also went to the day-old bread store. Great savings! sorry if this post is long, however….by doing exactly what donna suggests, I feed myself, a six foot six college student and a large dog on a little over $200 per month. we eat organic and healthy foods (both on specific diets), drink wine and coffee, eat lamb, free range chicken and eggs and both salad and veg and sometimes fruit at every meal. It can be done. At least in my area, loss leader meats and the like arent cheaper cuts, they’re the same items that were at the store the week before and the week after, just with a cut price this week. Theyre not trying to make money on the loss leaders people, they are trying to get you to buy other stuff-so dont. apartment freezers exist and are reasonable. Make space by freezing cooking items and anything else you have (like single or double servings of meats) flat in ziploc bags. As to whether all this discounted food is unhealthy, of course not. Just as the hue and cry about not having coupons for real food is untrie. I can link to an entire list of produce and organic coupons. As to the homemade-its relative. I make cookies with flour and sugar, I dont grind the wheat, so yes, if I didnt have acess to fresh tomatoes, I would use canned be they canned by me or del monte. This is exactly how I shop, and it makes me happy to see that I’m not alone. ALDI also has reasonably priced almonds; I can get a good sized bag there for about $3.50, and it lasts for about two weeks of regular daily munching. Really, I think a lot of people grossly overpay for food in the USA. Among my colleagues at work, none of whom make six figures, virtually all of them shop at the most expensive grocery store in town because that store has successfully turned shopping into a highly pleasurable, identity-gratifying, convenience-filled experience. The actual prices there are scandalously high, sometimes two to three times what you can get elsewhere. Sam’s Club, Costco and the like only make sense if you really buy and use huge amounts of things, i.e. if you have a family. My hubby and I shop at essentially two stores. 1) ALDI, which is great for staples and will surprise you occasionally with more than that. (Ours has had amazing cheese lately). 2) The local “low end” grocery, which caters to the less well off in our area, but which has a spectacular meat counter. Choice KC strips big enough for 2 people for $3—$4, cheap chicken, and every imaginable part of the pig you could ever want. When I tell people we shop at these places, they typically express surprise. One colleague told me he couldn’t shop at ALDI since he needs his grocery stores to be “happy places.” Fine enough, but I’d rather pay for less happiness now and go to Europe in the summer. When these places have sales, we stockpile, but the trick is to shelve an amount that makes sense for your household. We’re only two people, so we have a relatively small pantry and freezer, but we make use of them fully. This is such a good example of one of those cases where knowing yourself – and your habits – is critical. Food is one of our splurge items – we love cooking and experimenting with new things, and we like buying the best quality we can afford. For a long time, food was what blew our budget every month, because we couldn’t pass up a deal at the store, even if we didn’t need it. Things would sit in our pantry until they went bad, or we simply forgot about them. To break that cycle, we had to do the opposite of what’s advocated here – we implemented a policy that we could only buy at the grocery store what we needed to cook meals for the next three days. No more, no less. It has worked really well for us – we no longer buy large quantities, so we do miss out on savings sometimes, but we also don’t throw ANYTHING away anymore, and we have gotten our spending under control. If food is your indulgence, getting good deals on bulk items might not be worth it. All in all though, great article, and I really enjoy these pieces about finding ways to economize at home. Maybe it is my politics or the fact that I live in California, but I am dismayed at the reliance on big box stores and processed foods evidenced by Donna Freeman and the posters. Having read both Michael Pollan’s “The Omnivore’s Dilemma” and the writings of Jillian Michaels of Biggest Loser fame, I have gone almost totally organic, local and non-processed. Surprise, my food budget has gone down and the quality of what I eat has gone up. Can’t believe no one mentioned farmers markets as a great source of local, healthy food at below market prices. Bargains abound, especially as the farmers are packing up to leave. silver ware, and many other things at a 10th of the price. I’m an auctioneer and can tell you that many people buy piles of things for a dollar, then they take it home clean and sort and have a big yard sale. One guy built a 20×30 shed and had a sale once a month, never made less then a $1000 a day. They also resale some on ebay. @ #79 Catherine: Myself, I don’t buy a lot of processed foods. My staples are beans, rice, quinoa, vegetables, multi-nut butter, oatmeal, fruit, a little cheese, whole-grain bread, eggs and a relatively small amount of meat. Not everyone shares those eating habits, though, so I listed things like mac and cheese. Not everyone can afford to eat organically/locally processed foods. You and other commenters are lucky: The farmers’ markets in Seattle cost noticeably more than the grocery stores. But it’s the only time in the year when I eat fresh peaches and cherries. @79 Now, I don’t eat much processed foods, but some of us don’t have farmer’s markets to visit. I’ve been too busy to post all day but I love food and wanted to throw a couple of comments about the article. I haven’t read other comments so I apologize if I repeat something that’s already been said. I’m all for having a food bank, and I keep staples that have carried me through hard times, but I’d be wary of depending on many cans. Cans tend to have too much sodium, tend to have overcooked/overheated contents (eg. the good oil in sardines is ruined), and some cans are lined with potentital carcinogenics. You need a balance between low cost and good health. Dry goods you can get at the bulk section make great staples you can store, but they don’t last forever. I eat only brown rice and buy it organic at costco by the 14lb bag, but brown rice can go rancid after 6 months, so I keep it in mason jars inside the fridge. Rolled oats spoil sooner than steel cut as the oils inside are more exposed to the air. Same thing with whole wheat vs. while flour: whole wheat will go rancid while white flour lives on. One possible solution to this would be to buy wheat berries by the sack and use a flour mill to dispense whatever whole wheat flour you need for the day. Flour mills can be pricey though. Oh, also powedered milk or powdered whey makes great emergency rations for the non-lactose-intolerant. I’ve been cleaning up my pantry this month and found a bag of cornmeal, which is the cheapest grain produced in America– it’s great cooked as a mush with a couple of fried eggs on top. Not sure about the shelf life. And quinoa! Quinoa rules! High protein, highly versatile, quick to cook, amazing stuff. Carrots and other roots last a long time in the fridge– so does winter squash and things like that. I bought a huge lot of butternut squash on sale in December and I’ve been cooking it since. It’s delicious. You can also dice and freeze your own veggies, but soggy defrosted carrots are no good. I’d look into some kind of root cellar before buying a freezer. I’d get a freezer only if I had access to a large supply of good but inexpensive meat. I’ve looked into buying my own livestock and have it butchered; but between the time, the mileage, and the custom butcher charges, it doesn’t add up to great savings. Also, the setup cost might temporarily hurt your cash flow. So I’m sticking to Costco– their chicken breasts are awesome and cheap. Also, here’s an emergency menu for 4-6 people for $45 a week. @shash – thank you! It is really worth the effort, because it keeps us from having a layer of mystery stuff at the bottom of the freezer. And today I found coconut milk down there! Curry tomorrow, yum! The pantry is a bigger challenge. But when the pantry’s really bare and there’s something we’re *still* not eating, it probably means we really don’t like it and I should put it in the compost instead of letting it sit on the shelf another year. Estate sales? I hadn’t heard of that as an opportunity to get cheap food. That’s thinking outside the proverbial box! great ideas! it’s nice to hear someone else voice some of them, because I would be interested in getting food at a garage sale, but maybe a little squeamish about it. Now that someone else has mentioned it, it sounds much more ok to me. Has anyone mentioned Angel Food? Are they still in operation? I looked into it a few years ago, and decided I could do better with coupons & loss leaders, but for someone with little time or interest in that kind of thing, Angel Food might be a budget saver. We have something even better in our area, that I only found out about by word of mouth – a charity that gets about-to-expire food donated from the area grocery stores, then sells it in giant boxes, grab bag style, for $7 (fundraiser for them, and they don’t have income requirements for the people who purchase). We get all our bread this way – just keep it frozen until ready to eat – and some really deluxe things like a $40 lamb roast, as well as other basics: milk, produce, cheese, it changes daily and has to be used or frozen immediately. The moral of the story – keep your eyes & ears open, and put feelers out, for unique opportunities in your community. Great comment Catherine (#79). I’m a little disappointed with this piece as the cheaper alternatives suggested seem really unappetising. I like to keep the cost of food shopping to a minimum, but not at the price of compromising my principles (not eating battery farmed chicken or eggs, for example), or endorsing multinational businesses, (buy local and independent). As a populace we’ve lost the knowledge of eating what’s in season, so consequentially food is shipped all over the globe and prices are kept down by things like employing cheap labour. Read labels and you’ll see that a lot of times you’re just paying for a brand name or fancy packaging. If you’re talking convenience foods loaded with sugar, salt, fat and preservatives, then I’m with ya. Small house too, but I do keep multiples of things I use regularly as when they go on sale I buy a few so I always can make something! To Catherine (#79) and Patrick (#88), I’ll say that I’d like to buy more organic, local food, but the bald reality is that I can’t afford to except for special occasions. We have a superb farmer’s market in my town and at one point I made a resolution to do more of my shopping there. I couldn’t sustain it, since it cost a fortune. I recall buying 1/2 lb of bacon and some pork chops from a local farmer, and paying $22 for them! We’re not poor, but we can’t pay prices like that on a regular basis. It’s just not realistic. Fruit is also ridiculously expensive at our farmer’s market. I can’t spend $8 for 5 apples, no matter how responsible the growers were. We calculated once that buying enough cherries for a pie would cost us something like $35, which is insanity itself. Organic/local food may have good reasons for costing more, but my sense is that a lot of suppliers liberally mark up their prices beyond a normal profit simply because they can. People will pay more to feel like they’re doing the right thing, and organic/local is the hot concept in food right now. Our farmer’s market is crazily busy all year round, so clearly it’s working. Catherine and Pat rick, it seems to me youre making assumptions here. My two hundred a month doesnt include very many processed foods. Most of my pantry is staples-beans, rice, baking products, condiments, spices and the like. I do stock things like broth, canned tomatoes and tomatoe sauce and paste, olives, and those kinds of things. Also at least a few canned soups. My freezer does include some ready made garlic breads and many frozen veggies. Just as an example, (realizing it is not everyones taste), this week my menu will include chili made from scratch, barbecue chicken with homemade corn bread, lambchops with brown rice, shrimp alfredo (the alfredo sauce will be store bought), and homemade beef stew. All meals will include fresh or frozen veggies, fresh salad and desserts or fruits-and thats just dinner. I can assure you these are mainly healthy ingredients and as a retired gal on a fixed income I could not afford to eat like that without stocking up and shopping loss leaders. I shop at Whole Foods, even for organics that I could find cheaper elsewhere, because they pay their workers a fair salary and offer basic health insurance. Not only is their supply line (animals, harvesters, etc) treated better than at cheaper stores, but I’m supporting my community by standing up for a living wage. If your store is not charging a lot of money for food, its staff is probably working minimum wage; it’s a race to the bottom so that I can spend less money. Higher prices = higher wages = higher quality of life for everyone and not just the person saving money by buying cheaper stuff. I am lucky enough to have a large yard in which to garden. I would rather be gardening than anything else! This allows me to can & freeze a great deal of produce. I also share with friends, family and strangers! I have a freezer in the garage that was a “hand me down” from my in laws. It costs about $20 a month to run but is well worth it. I stock up on loss leaders of all types; meat, flour, produce etc. I have a good friend to lives in an appartment. She keeps a small chest freezer on her covered patio, covers it and uses it as a table. This allows her to pick up loss leader meats to feed her always hungry college student son. She also uses her hall closet as a food and gift pantry. I never was much for keeping a canned good pantry until about 12 years ago. My husband’s grandfather passed away & the home had to be sold. The grandparents had an extensive pantry and no one else in the family wanted any of it so all the food came to my house. It was amazing how helpful all thise canned items were. I have been a believer ever since! Everyone can do something to lower their food costs, you just have to find what works for your family. it’s great you can shop for everything at whole foods, but for a lot of people (my family included) it’s simply an impossibility. there was a time when i’d try to buy everything there because it was “the right thing” or whatever– i ended up buying groceries on credit. not a good thing. then i have a friend who worked at whole foods– it’d a decent company by corporate standards, but it’s not a worker’s paradise by any means. costco treats their employees right, pays well and provides health benefits even for part timers, but it’s cheaper than whole foods due to their business model (pay cash, pay membership, buy large), and you can buy a few organic products from a selection i hope will keep growing. i get lundberg organic brown rice (by the sack), bob’s red mill quinoa, costco brand organic peanut butter, costco brand organic olive oil, and other assorted products. their cheese prices i think can’t be beat. not a huge selection yet, but there are alternatives to whole foods for those who can’t afford $18 for a pint of olive oil. also, i’ve taken a liking to walmart in recent years, in part because they are great at their own game (i do admire that), in part because of their support for universal health care (which i also favor), and in spite of their purported crimes against humanity they are starting to carry organic foods & biodegradable cleaning supplies– that’s where we buy horizon milk, seventh generation detergent, kashi products, etc. as demand increases, the list keeps growing. in the southwest there is also sunflower market, which beats whole foods prices on a regular basis, making organic food available to people who couldn’t have it otherwise. there i ran recently into an ex-employee of my local food coop and he said he liked working at that supermarket better. there are similar local chains across the country. and there’s also food co-ops. my local one is wonderful but overpriced for produce and packaged goods– however, their bulk section is wonderful and cheap . i would love to buy everything there but i can’t afford to subsidize them 100%. a sliver of salmon for $12? no way! my local farmer’s markets are nice in summer, but they cater to an affluent clientele, and charge accordingly, so i’m hoping to start my own planter boxes this spring and see what grows. the point of my long ramble is that one can diversify the sources of organic, local and pesticide-free foods to get a better bang for the buck. granted, the organic standards are being gradually diluted as they go mainstream, but i favor the mainstreaming of organic products regardless– the more people consume them the less we poison the planet in spite of the system’s imperfections, the perfect being the enemy of the good and what not. I do the food buying for a wilderness therapy program. We focus a lot on dry goods and staples because they are high in calories and very cheap in bulk. We buy from local place that does bulk foods and restaurant supply, it’s even open to locals as well at no mark up. For people in larger areas, find a locally owned bulk/natural foods store and talk to them about putting in a special order. The natural food store a town over charges 15% on top the wholesale price for that service. All you need to do is come pick it up. The best way to get food cheap is to buy quantity. Go in with some friends. I’ve found organic whole wheat flour in bulk for the same price as bleached white at the store. Also a great buy for nuts, trail mixes and dried fruits. Plus you save on packaging, great for the environment. I love our food stock! It has saved us during layoffs, and it really comes in handy if there’s an illness. Recently I ended up in bed and my husband got hurt- on crutches- and it was nice knowing we didn’t *have* to go to the store. You mentioned zucchini which means that I have to share this tip! If you have extra zucchini, wash it really well, cut it up into a few big chunks and puree it in the blender. You can pour the puree into an ice tray (or some other small, freezer safe storage) and freeze it. Then when making sauces, stirfrys, banana bread, vegetable/chicken stock or whatever else you can think of, you can pop zucchini cubes in for instant, mostly tasteless nutrition. It also helps thicken sauces and you can use it in place of half of the oil in a recipe. It’s my favorite fresh produce tip. My husband and I recently bought 93% lean ground beef and boneless skinless chicken breasts in bulk (30 pounds each, I believe) through a company called Zaycon foods. Then I repackaged the items in freezer bags, labeled them, and threw them in our extra freezer. The savings is worth it, and the food is healthier. We have a well-stocked kitchen, and if we needed to cut down our grocery budget for one month or more, we could get by just fine without having to sacrifice taste. This is what I do also for our food. My problem is that my kid eats food that is different from what we are eating. I’ve been thinking.why stop at just saving food and money for our family.why not start a gardening seeds,clothing,personal items ,pet supplies storage for your family members also.making these things freely available to all of your family members.have your entire family get involved.this way everyone will always have. The first PF book I ever read, Andrew Tobias’ The Only Investment Book You’ll Ever Need, recommended buying shelf-stable food on sale, even if you had to store the tuna fish under the bed. Some loss leaders go in cycles, so I stock up on toilet paper every couple of months. Shoprite’s semi-annual Can-Can Sale is like a national holiday around here! Al good tips, but i have to admit the title really threw me off! Not sure how the term is used in the U.S., but in Canada a food bank is a charity that provides food to people in need. Saving money on groceries is a concept that resonates with people, setting up a charity to benefit yourself… well… not so much…. My challenge with rising food prices is the fresh stuff — that is, the fresh meat and fresh produce. I’m becoming much more mindful about food waste, making good use of the freezer and branching out into meatless meals. IMHO, part of changing our shopping habits is changing out eating habits too! Fact is, I contribute to food banks regularly. One reason I can do so is that I’m careful with my own food funds. These are great tips, many of which I already do, but there are lots of new good ideas, too. I cook dry beans 2 pounds at a time in my crock pot and then freeze them in old spaghetti jars. We’ve also learned canning to preserve our garden goodies all year. I am a little less motivated to stock up on the staples that are always inexpensive at ALDI, which is the closest grocery store to me. Sometimes they have quick sale chicken marked down to 50 cents or less per pound, and pork for $1/pound. I buy it ALL and stash it in the deep freezer so I rarely have to pay full price. We cook dry beans and freeze them flat in Ziploc bags (reused ones, of course!) so that they’ll store more easily. The cooking liquid gets frozen separately, to be added to soups, stews and other dishes. Sure wish there were an ALDI store where I live. We also have a wonderful Aldi store near us. Super excited to check out a bakery outlet! I have never heard of such a thing! Depending on the store you may find some very interesting stuff. We’ve obtained spices, frozen burritos (cheaper than we could make them), pizza shells and sardines at our local outlet. We’ve gotten Dave’s Killer Bread for a dollar a loaf. That stuff’s pretty expensive in the supermarket. The tortillas are always a steal. My partner has a corn-chip hack: When those crispy tostada shells are three packages for a dollar, he buys them to eat alongside sandwiches. They taste pretty much the same, he says. To Donna’s comment I will add: Be sure you know your prices. I was excited to see a new (X Brand) dead bread* store opening near one of my regular stops. Alas, I discovered that their prices were awful. What a shame for people who are not astute enough to know the difference. Just because it says outlet doesn’t mean it’s cheaper. Don’t get me wrong, I love my Oroweat Outlet, but all the local ones have closed and the only one left is way too far away for anything but occasional stocking up, if I happen to be in that area, which is seldom. *I’m from a family of eight, that’s what we always called it, with great affection. Good point: If it costs more in the outlet than it does in the supermarket, why bother? I cleaned out everything (pantry, freezer, fridge) this weekend, and stocking up is not my problem. Using what I stock up, that’s my problem. After the weekend, I realized some of our problem with food waste is due to lack of organization. I will have to try your master list idea. I’ve always loved this idea. My living situation at the moment would make it difficult to do, but I try. I have amy own “Costco” closet set aside for bulk/ sale items (not all from Costco). I eat mostly non-processed, so it’s mainly paper goods. But I bulk purchase tea (since I drink about 4-6 cups/day) and things like brown rice, raw nuts, and frozen meat. I will freeze fruit in little baggies for enough smoothies for 1 month. I will also buy in season produce when prices are cheapest and freeze that for out of season (when prices are higher and the quality is not as good). I think it’s more challenging when you eat a mainly fresh/whole foods diet, but if you make room in the freezer you can cook fresh meals and freeze them. You can even freeze greek yogurt. I like this idea also as an emergency food fun as well. For many of us food is one of the most expensive line items in our budget and if something should happen like a job loss, you can drastically reduce your food budget if you already have a well-stocked freezer/pantry. Before I took my planned time off of work, I went to costco and bought brown rice, bags of raw nuts, and frozen chicken and fish filets. I ate mostly that for 4 of the 6 months I wasn’t working full time (the other 2 months I was traveling). I just finished up the last of the rice a few months ago. Saved a BUNCH on food by not having to purchase it. I also harvested veggies from my parents’ small backyard homestead, so that helped a lot. My partner just took everything out of the 5.5-cubic-foot freezer (brought it with me when I moved back up here) and re-did the master list. In addition to the on-sale meats and poultry we were lucky to have added Copper River red salmon, moose, halibut and rhubarb that people gave us, along with a ton of raspberries from the yard. We store other things that we grow: dehydrated kale and Asian and turnip greens; potatoes and squash stored “down cellar,” as we used to say in South Jersey; and canned carrots, turnips, pickled cabbage and raspberry jam. The basement also has Costco-sized bags of flour, beans, rice and sugar, and lots of canned and bottled goods. None of this stuff goes bad because — like you — we make it our business to use these items regularly vs. running out to buy groceries regularly. In fact, we rarely go the supermarket and when we do it’s just for a hand of bananas or a gallon of milk. I really appreciate not having to line up at the checkout counter every week. How do you store fresh foods like potatoes, carrots and onions “down cellar”? Special containers? Wrapped in newspapers? Temperatures? We have an unheated half dirt basement, and we never got around to cementing the floor. But, it is covered in rocks and gravel with metal grates on top of the rocks and gravel, and you can stand up in the basement now. It also houses washer, dryer, lots of clothes, boxes of books, 2 sump pumps and a dehumidifier. Not much room to add anything else, but plastic tubs might work, or small trash cans, or plastic junk food containers. Another source for some to get to know your neighbors and glean backyard fruits and veggies is your local “buy nothing” network. Hmmm i never heard of “gleaning”, it sounds interesting enough though. Im gonna research it and see if its a viable option in North Carolina. Thanks for the tips! I love all of these ideas Donna. My principal problem is time and energy. After working all day at a strenuous job(teaching) I have little time or energy for searching various stores, canning, freezing etc. I do though always cook from scratch which is a saving in itself. Having read your post, I will though, try to stock up on various on sale items as they become available in my local stores. I hear you. Do what you can with the time/energy you have, and when you see a good price buy more than one item. One thing I would add is to check expiration dates! Some food items I regularly buy were buy 4, get 1 free on back-to-school special. At first, I thought “no way would I eat this stuff fast enough to take advantage of the deal!” Then I realized the expiry date was more than a year out — plenty of time. And don’t forget to rotate like the grocery stores do — newest items go at the back so you reach for the oldest first. For many years, while kids were still at home, we bought our bread, several loaves at a time, at Costco at a low price … and kept it in our freezer so that we never ran out of bread and had to run to the store. Before Costco arrived on our island we did the same but with day old bread from the bakery store. Love Cash and Carry. It compliments our regular Costco trips as C&C carries more of the restaurant size while the local Costcos carry the large family size (unless you are up in Lynnwood or down at Southcenter). We love our chest freezer as it allows us to get low $/lb of meats that we can go through the following months (family of 6). However you should have an alarm for loss of power. One time when we had a extended power outage, we covered our chest freezer with multiple quilts. Everything was still frozen 2 days later. We put cardboard on the top (the lid) and about 6 quilts on top of that. We keep staples like beans and rice in our shelves that we buy from Costco. We tend to eat the same foods so we buy in bulk of what we tend to eat all the time. I know you are writing this for good financial and household management but it WILL really help too if there is a sudden huge disaster and help is going to be 3-5 days away. Like having an emergency account, having some basic foods always in the cupboard also gives that sense of security. Good to be reading you again! All great tips. Would just add to check mark-down stores like Ross and TJ Maxx — they have specialty food sections with teas, jams, syrups, myriad spices and spice mixes,cookies, etc. Sometimes overpriced but today I found a big jar of imported Italian garlic and parsley sea salt on clearance marked down to $1.00. Teas are a bit more expensive but the British stuff is really good; I figure the 50 bags for 3.99 works out to 8 cents a swig. Cheaper than Starbucks, at least. Also — always check the clearance racks at your local grocers — my Vons and Ralphs (S0 Cal)have awesome deals on all kinds of unexpected stuff — bakery, less than lovely produce, canned stuff, even booze, which some might not consider emergency rations. I beg to differ. Dave’s Killer bread is the bomb — have never seen it marked down, must find bakery outlet ASAP. Anyway, happy to reconnect with your blog and great writing. Cheers! Thanks for this tip. I wouldn’t have thought of TJ Maxx because there isn’t one in Anchorage. And I’m still writing at donnafreedman.com — come see me there, too! These are helpful tips as long as items do not go bad, get stale. Savings can become loss very quickly! Know thyself and whether you’ll store and rotate items appropriately. Even Ivory soap gets weird looking after 5 years! Usable with a shriveled exterior, at least in the humid environment where I live. The few losses experienced due to not keeping up has led me to examine choices in this game. If stored too long, even in a tight jar, dry split peas will become too hard eat, even soaked then boiled & boiled. Cockroaches & silver fish like paper so I must be careful with how much & where I store toilet paper. I am careful about my freezer during hurricane season due to the risk of extended power outage. From June through October my freezer has no more than we’d eat within days. It’s difficult to understand people with packed freezers of foods when 1) they don’t get around to eating it (because something is frozen doesn’t mean it’s in suspended animation) OR 2) one decent power loss & it’s all gone (some claim it on their insurance which irks me).